These two receivers are quite similar in terms of supporting a 7.2 channel setup. Similarly, both of the models support a 4K at 60 Hz with HDR. TX-NR686 is deliberately THX certified, whereas the TX-NR676 features VLSC that helps in improvement of the output of the audio signals. When comparing the two models in terms of sound quality and output, NR686 is slightly more impressive than the NR 676. The total power output comparison shows that TX-NR686 is more powerful, almost about 800 Watt than the other model TX-NR676 of 700 Watt, strikingly, they are quite similar and are produces by the same company. When it comes to connectivity, both are quite similar, and both the models consist of similar HDMI ports. Both of them are fully capable in terms of supporting the wireless connectivity protocol that encloses the two; Bluetooth and Wi-Fi. You can also easily access different audio streaming services such as Spotify etc. The best part is that both of the models support Chromecast technology and the receivers are programmed and systemized to support several zones. The AccuEQ system helps in setting the audio balance and to control its frequency etc. You can also set up and tweak speakers automatically which is one great ease for the customers. 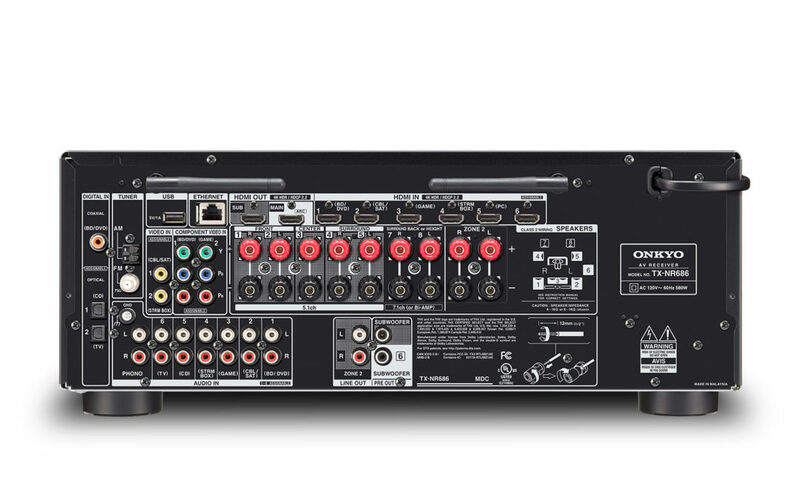 Once again as per observation and usage, there is not much difference in the Onkyo TX-NR676 vs TX-NR686, so you cannot expect any major differences. The front display is very minimalistic and simplistic in terms of design, giving off a classic look, as well as only providing the basic details. There are two knobs situated on the very left side that work for tone and mode for listening the type of sound you are playing. There is another knob on the right side of both the models, and also in the center as well to connect and switch to Bluetooth mode. The front flap covers up most buttons and inputs in both of the models. Coming to the remote control for both the models, it plays the most important functions. These functions include volume minimizing and maximizing, access to the menu, controlling the mode and zone and other things as well. Physically describing, the two models are again almost the same in terms of weight and size – NR686 is 14.9×17.1×6.8 inches, while NR676 is 14.8×17.1×6.8 inches. Their weight is 22 pounds. Both models have easy and fast controlling zones. The application for controlling the receiver works smooth and effortlessly while also providing many functions. HDMI board can be unreliable and difficult to use. Firmware updating may take la long duration to complete. The setup process is relatively very easy as compared to the NR676. It provides excellent audio quality that is clear and distortion free. Speakers may need a little tuning to enhance its result. It may produce some issues while dealing with the input.